Why do people build custom motorcycles? There’s at least one obvious answer: they do it so they can have a custom motorcycle. Don’t get me wrong: the pride of owning a custom motorcycle is definitely a strong motivator. But now that I’m a year into my XL project, I know that by the time it’s done, I’ll have gained much more than a rebuilt enduro. And though the title of this article is tongue-in-cheek (there aren’t any studies on the benefits of building a motorcycle — yet! ), I’ve found that what science says about finding success, enjoyment, and meaning in life aligns surprisingly well with what I’ve felt when I’m up to my elbows in grease. There’s a lot of research out there, so I can’t cover it all in one post. So let’s start small, with four ways the worlds of psychology and vintage motorcycles coincide. If you’re a member of western society, everyone is battling for your attention. Your phone buzzes for everything from incoming calls to nearby Pokemon. Pop-up ads dominate our screens, and click-bait headlines will say anything to win a tap. But when you’re working on a motorcycle project, it all fades away. Out there in the garage, it’s just you, the bike, and the work ahead. According to Csikszentmihalyi, achieving a flow state has many benefits. First, it is one of the most enjoyable states of being. Csikszentmihalyi found that people enjoyed “activities that require the investment of psychic energy” more than typical leisure activities like watching TV. In modern life, though, flow is important for another reason: it helps us regain our focus. I was reading the other day that the human attention span has allegedly degenerated to 8 seconds. I think that’s why I love working on bikes. You have to focus. Think. Concentrate. Co-ordinate hand and eye. For hours on end. Working on a motorcycle demands focus. You can’t jump from one thing to the next, as digital tools encourage and even train us to do. It might be hard at first, but as meditation practitioners say, your mind is like a muscle. With practice, you’ll be flowing with your project in no time. 2) You learn the benefits of intrinsic motivation. No matter how it looks on Instagram, my XL project hasn’t been easy. Sometimes it’s hard for the dumbest reasons. Last weekend, I wrestled for an hour with a bit that got stuck in my impact driver. But I keep going. Why? Because I want to. Because this project is important to me. Because I care about doing a good job. Notice, these reasons are all about me. But don’t be too quick to accuse me of being an entitled millennial. According to the science of intrinsic motivation, this is actually a good thing. In studies going back to the 1970s, researchers have found that when people are intrinsically motivated, they tend to perform better than when they’re motivated by external motivations, like punishments or rewards. Many of us grew up in an education system that relied on a network of external motivations. We studied to get good grades, got good grades to get into a good college, did well in college to get a good job… and so on. Part of the problem is, as Kohn points out, it was simply assumed that we wanted those rewards. Nobody asked us, or even asked us to think about, what we genuinely wanted from life. Committing yourself to a challenging, self-motivated project not only gives you the chance to pursue a passion, but also the opportunity to explore your limits and values. In other words, rebuilding a motorcycle gives you the chance to define and create the person you want to be. 3) You learn to see the world from another point of view. I have this vision of myself, hopefully only a few months from now, starting up my XL for the first time. I kick the starter over once, twice, again … and nothing happens. In that moment, I’ll have a decision to make. Will I give in to my frustration? Will I kick and kick and kick until my leg goes numb? Hopefully not. Hopefully, I will remember that to get what I want (a running motorcycle), first I have to make sure the motorcycle has what it needs. Working on a motorcycle, you have an end goal: get the bike rebuilt and running again. But to achieve that goal, you have to learn to see the world from a different point of view: your motorcycle’s. This same perspective-shifting skill can help us with one of life’s great challenges: coping with loss. As a psychology professor and husband to a novelist, James Pennebaker understands the importance of “life stories.” He wanted to know, what happens to our life stories when we experience loss? “Do I change my story about my life, or do I continue persevering with the old story even though the facts don’t fit?” he said in an interview on the Invisibilia podcast. Working on our motorcycles, we learn how to deal with a challenge by reframing the problem. This skill is useful not only in motorcycle maintenance, but in life as well. 4) Humans have a basic need to influence their environments. In the early 1900s, most psychologists explained human behavior as a response to either environmental stimuli or biological needs. Effectance motivation goes beyond filling basic biological needs, like hunger or thirst, or to reduce discomfort. Effectance motivation drives us to improve ourselves in meaningful ways. And, I’d argue, effectance motivation is one of the reasons we build motorcycles. But there’s another piece of this that is particularly poignant for modern life. Working on motorcycles gives us an opportunity we rarely get in modern life: the opportunity to make something real. Sure, it’s only a motorcycle. But it’s something real and tangible. And it’s something that wouldn’t have happened if we hadn’t rolled up our sleeves and put in the work. Which is a hell of a lot more than I can say for a tweet. There are many reasons people build custom motorcycles. We work on motorcycles to improve ourselves, focus ourselves, discover ourselves, fulfill ourselves, and assert ourselves. 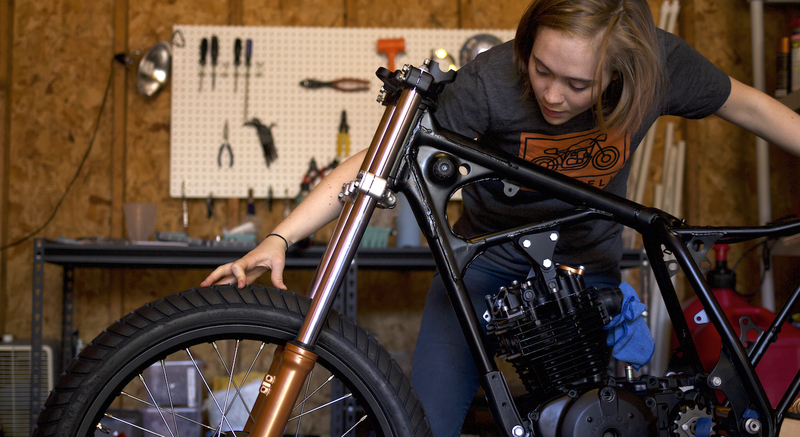 Rebuilding a motorcycle won’t automatically make you a better, happier, more fulfilled person. Nothing in this world can do that. But if you’re paying attention, it gives you plenty of chances. If you want to build your own custom motorcycle, but have no idea where to begin, I wholeheartedly recommend the resources created by Matt McCleod at Krank Engineering. His empathy and enthusiasm provide the direction, support and guidance a newbie mechanic needs. Here it is, I knew it. Now you made me want to make me a custom bike. Jokes aside, seriously, really interesting. Thanks Matteo!! You know what I’m going to say… you should do it!! 😀 Thanks for reading! The fact that my hands belong nowhere near the inner-workings of anything with a motor that travels via land, sea, or air, is nearly a matter of public record 🙄; but this piece spoke to me nonetheless. It did so because of what distinguishes the RIDEWELL blog from other blogs and articles of the very same subject – raw passion that is somehow, at once, bridled and heightened by research. The beauty of this piece is that it fits perfectly with meching-out on a custom build; but the science behind it applies, and can be translated, to so much more. And that’s a GOOD thing! Had the RIDEWELL blog only related to we members of Moto-Culture (riders, mechs, both), it would have run out of gas (no pun intended) long ago. I’m pretty sure Csikszentmihalyi (just going to call him “Cheeky” from here on out, because I was 8 before I could spell my own name) didn’t have old Yamahas and Kawasakis in mind when he wrote, “The state in which people are so involved in an activity that nothing else seems to matter; the experience itself is so enjoyable that people will do it even at great cost, for the sheer sake of doing it.” Or maybe he did. Life is funny that way. I’ve seen some people on bikes that I would have never imagined had ever looked at one. The point is, this piece, like so many of the other RIDEWELL pieces before it reaches the reader from a Moto-Culture perspective; but also from one of life in general. As a boy, I used to make things out of anything. Nothing that I could get my hands on was safe from my tinkering. I was the physical embodiment of White’s Effectance theory. I saw something in everything. Small things could be a part of a big thing; and a big thing could be part of even bigger things. My compulsion to transform life and my surroundings was insatiable; and when I was building / creating, the rest of the world just fell away. Also, like Alfie Kohn accurately stated, it was not the praise of friends and family telling me how great my creations were and how unique my perspective of the world was that drove me; nor did death threats from my sisters for taking apart their radios inhibit me. I was overcome by a burning desire to take what was; see what it could be; and then bring my vision to life. I never needed external influences – positive nor negative, which is one of myriad reasons I don’t spank my kids (nor do I judge people who spank theirs). I was driven by an inner force that I never afforded analytical thought before coming across the past of writings of this blog. Utilizing waypoints from Cheeky to Crawford; and from Kohn to White, you have charted a pathway to better understanding so much of what drives and defines us. As you know, one of my goals is to help non-riders relate to why we motorcyclists love our motorcycles so much — and help us understand it a bit better too. I’ve never subscribed to the “only a real rider will understand this” mentality; in my opinion each hobby or passion fills a human need we all share, even if we use different tools to satisfy those needs. The more we can empathize with each other and find common ground, the better off we’ll be. Thanks as always for reading, Ohene, and for your wonderful contributions! Have a great weekend! !